There was a time when everybody agreed that Gillette was the best razor a man could get. But after Mike's first Dollar Shave Club video went viral, things have never been the same. Two tribes were made. While the older generation stayed loyal to the razor company they'd known for decades, Dollar Shave Club swept the younger generation off their feet. 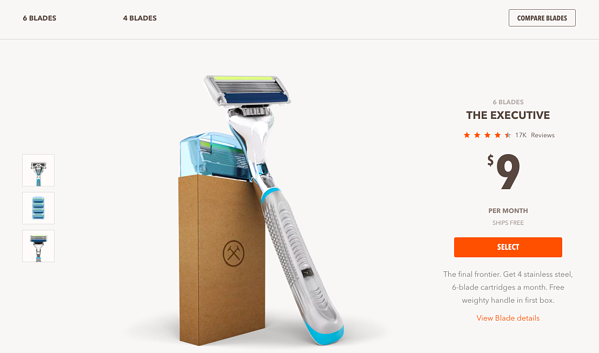 So is it their “cool” branding or is it their awesome subscription model that makes Dollar Shave Club appealing? It's probably both! But Gillette responded well with their On-Demand series and thus the razor war began! Why is too much money being left on the table? In an attempt to beat the competition, both Gillette and Dollar Shave Club are priced pretty low. While this is great for customers, is that really a great idea? Along with some confusing copy—for example, “4 Blade Refills” can be easily mistaken for “4-blade refills”—there are some irritating alignment issues. 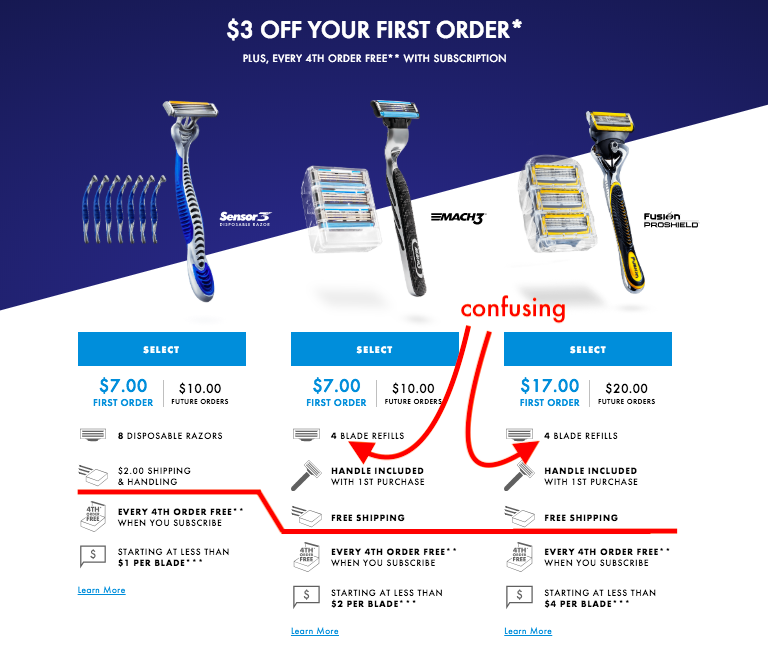 While Dollar Shave Club is a clear winner when it comes to the pricing page UX, both brands have some serious rethinking to do when it comes to pricing strategy. 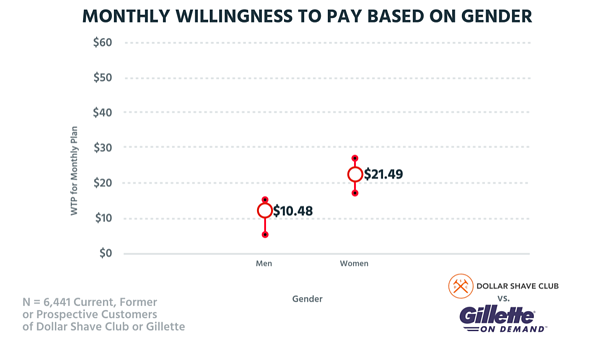 Though Gillette does have an offering at the higher range, most of the pricing options for both companies are actually tailored toward customers who don't use the product frequently. 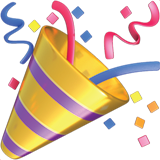 This works as an acquisition device but fails the retention and monetization test. If you rarely use razors and are getting sent a new one with new blades each month, you are soon going to be overstocked. Sooner or later, you'll stop your subscription. 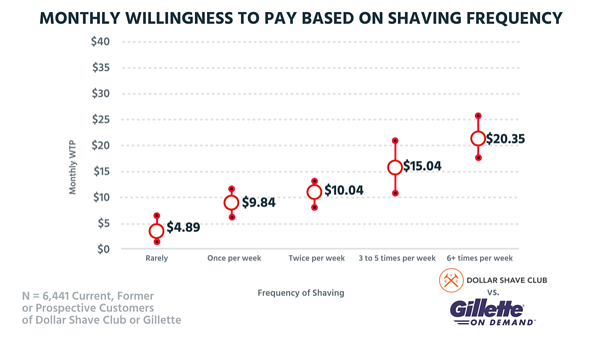 By pricing a little higher and going after those customers who truly value never having to go to the drugstore for more blades (i.e., the ones using their razors daily, both companies could increase ARPU and potentially the lifetime value of those customers. 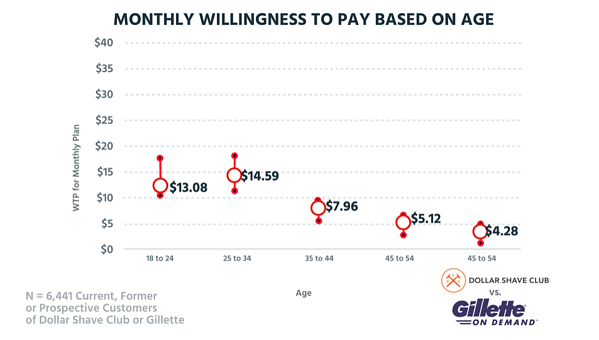 When it comes to the older cohorts, the willingness to spend is way lower because they're not used to buying anything, not just razors, this way. For those under 35, subscriptions are becoming a normal part of life. Bottom line is that both Gillette and Dollar Shave Club are leaving too much money on the table here. 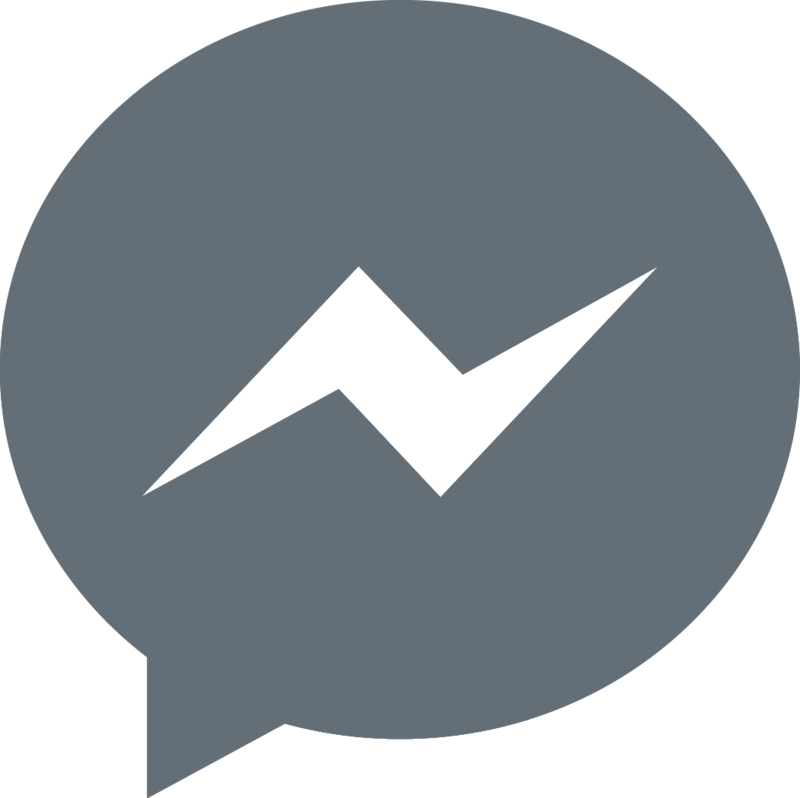 They could easily increase their pricing, better target their core demographic, and improve monetization and retention of this group. "We actually met Mike in Dublin like five, six years ago, when it was just Dollar Shave Club, and we asked, 'Oh! What's next?' and he said, 'We're gonna take over the bathroom!'" Dollar Shave Club really does raise their ARPU by taking over the bathroom. Not everyone wants all these products, but the customers who do are more willing to pay. It's also great from a customer-utility perspective that can in turn reduce churn. 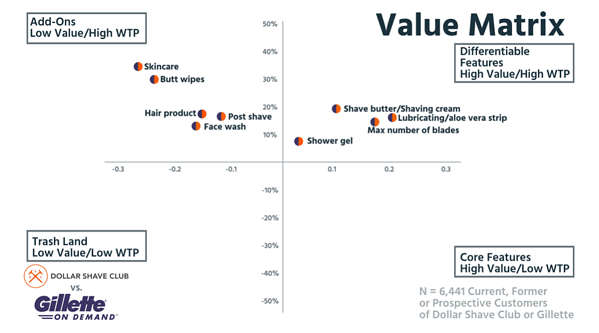 If the product is good, customers will be happy to stay within the Dollar Shave Club ecosystem. Here, Gillette is missing out on not just a lot of revenue but also the opportunity to take some wind out of Dollar Shave Club's sails (pun intended). How can you miss 50% of the human population? Our survey indicates that women are willing to pay at least twice as much as men. This is a market that both Dollar Shave Club and Gillette seem to be completely blind to. Dollar Shave Club does mention in some corner of their Help Center that their products are unisex. But if they are serious about this demographic, they shouldn't be selling their best razors at $9 a month. Who will win the razor war? 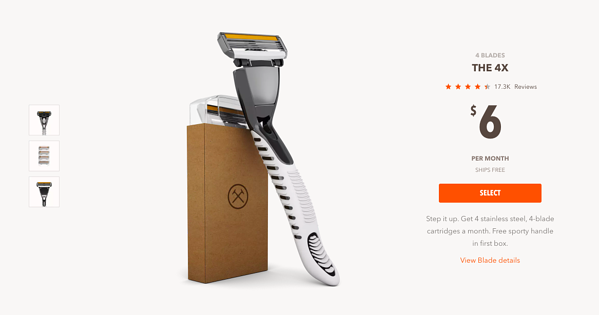 Dollar Shave Club is a bit ahead when it comes to branding. They feel like a 21st-century brand and can easily attract the younger generation. However, for many men, Gillette still evokes quality in a way no other brand can. So the main game changer is Dollar Shave Club moving on to other bathroom products. It's the smartest thing they've done to raise the ARPU. However, Gillette always has the scale and the width to shift gears whenever they want. By coming into the subscription game, Gillette has already proved that they are an egoless company ready to take on any business model. It's time they convert the razor war into a bathroom war. We can safely say that the razor war has just begun! So are you for beards or against beards? Vote right now, because one lucky winner is going to get a year's subscription of Dollar Shave Club or Gillette On-Demand!